This is my first coeliac Christmas and it’s taken me by surprise. Nine months in and I thought I was getting used to the change in eating habits. But Christmas is really an added challenge, isn’t it? Things I tend to forget about from year to year seem to keep popping up to taunt me: stollen, German lebkuchen biscuits, mince pies! I do feel like I’m missing out. 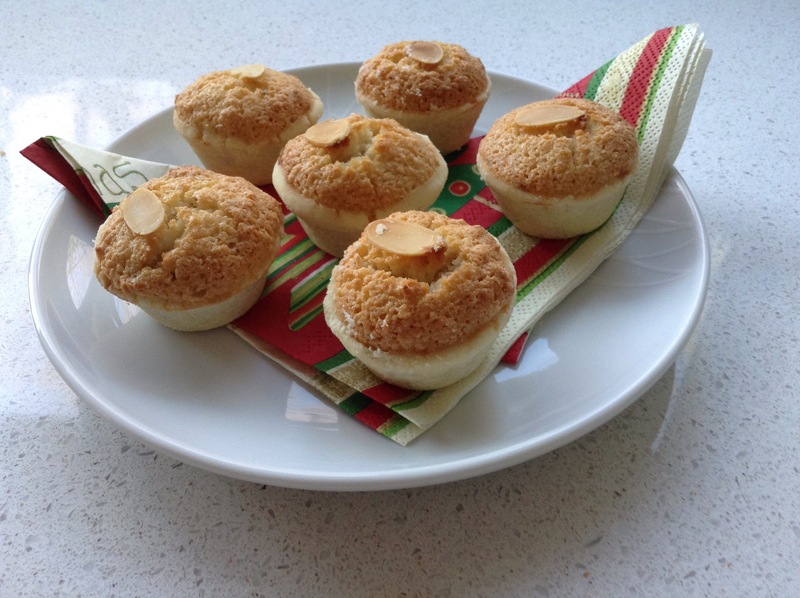 My 6 year old LOVES mince pies and in our family we tend to make them with a macaroon topping, which gives them a slight crunch and makes them look very pretty. I haven’t seen them in the shops so I agreed to make some. I’m still trying to stay low sugar, so I made mini ones. I used Doves Farm gluten free plain flour for the pastry and followed their very simple shortcrust pastry recipe, which you can find here. This pastry doesn’t work so well with cutters so I pressed balls of pastry into the (greased) mini muffin tray and shaped them with a dibber. The set was one I got from a Pampered Chef party BC*. Lightly beat the egg whites. Fold in the caster sugar and ground almonds. Stir in the cornflour blended with water and vanilla essence. Easy! This mixture topped about 20 mini mince pies. Spoon the mixture on each of the mincepies instead of using a pastry top. Pop a single almond slice on each mince pie, and pop them in the oven at 190C for about 20 mins. They rise into beautiful little domes and go lovely and brown. Gorgeous looking pies! And I like the topping. Thanks – they taste of Christmas!